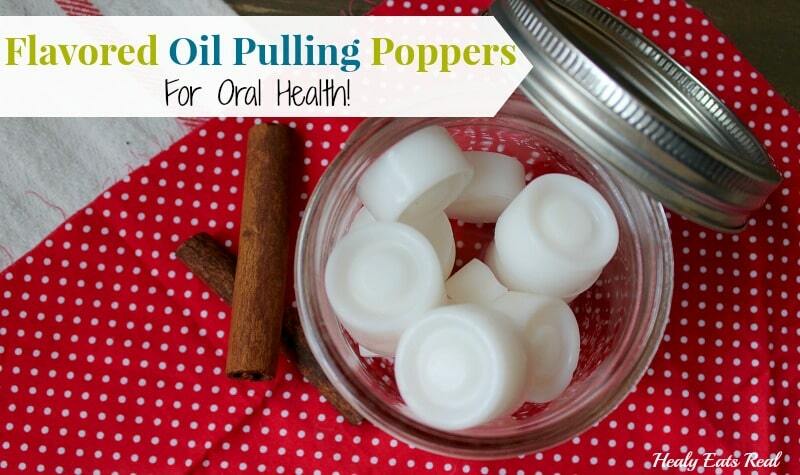 Home » Healthy Tips » Flavored Oil Pulling Poppers for Oral Health! Do you oil pull each morning? If you don’t already, you should start! 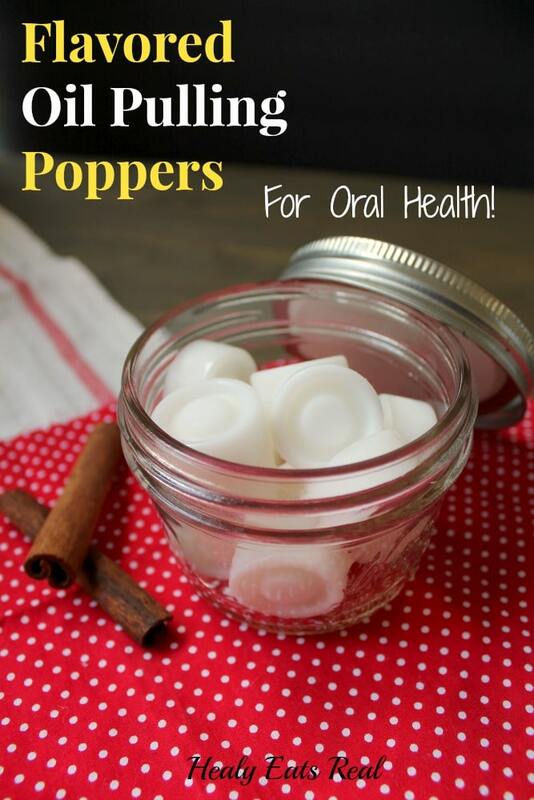 It’s a great way to improve oral health since tooth brushing can only do so much! If you aren’t familiar with it, oil pulling started as an ancient ayurvedic practice that has been used for thousands of years to pull bacteria and toxins out of the mouth with oil. Basically, first thing in the morning put about a tablespoon of oil (I like coconut oil) in your mouth and swish it around for about 20 minutes, then spit it out. Do not swallow any of the coconut oil since it contains all of the bacteria. The oil is said to help get the bacteria that tooth brushing misses… especially between the teeth and hard to reach areas. 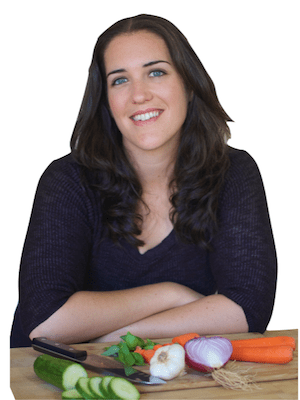 What is the benefit to oil pulling? I agree, it can be hard to swish around the coconut oil for the full 20 minutes at first, but just start off doing it for 5 minutes and work your way up, it will get easier. Do it while you are preparing breakfast or getting ready for work. If your mind is occupied on something else, the time will fly by faster. This also helps with the swallowing aspect…it helps to not think about it too much. As far as the oil tasting weird and activating the gag reflex, I think these oil poppers help to solve that problem. For me, the coconut oil does taste weird and it is tough keeping it in my mouth for so long, but after adding essential oils to it, it is much more pleasant! On top of that, the essential oils may also support oral health. Make sure your essential oils are cleared for internal use! I only use Young Living essential oils because they are safe to use internally. Most store-bought essential oils will have a warning on the label “Not for internal use”. This is often because most store-bought essential oils contain synthetic additives that are not safe for consumption, however there are no regulations on using the term “pure” or “natural” on essential oils and they are not required to include the ingredients on the label. Young Living is different because their vitality oils are actually regulated by the FDA as dietary supplements, so they are required to list all ingredients on the label…which is always 100% pure essential oils. Yes, you can buy essential oils anywhere, but they are not always going to be pure and 100% therapeutic grade, which means that they might not even be effective for the therapeutic uses that you want them for! This is why I only use Young Living! 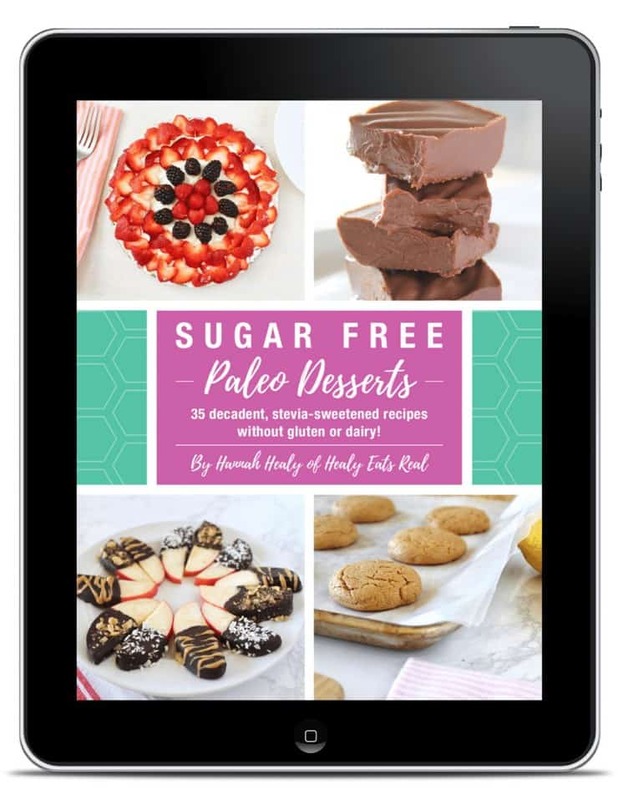 In a double boiler over medium heat, melt 1/2 cup of coconut oil until it is melted. I like to use a glass pyrex measuring cup and put that in a pot with water over the stove. That way it’s easier to pour the coconut oil straight into the molds. Once the coconut oil is melted, remove it from the heat and add 10 drops of essential oil to the coconut oil. Gently stir with a metal spoon. Get one silicone candy mold and pour the oil mixture into the candy molds. Place the mold into the freezer until the oil has completely hardened. Take the oil out of the molds and store them in a jar in the fridge. Take one out each morning to use for your morning oil pull! Just pop them in your mouth and chew on them and they will melt, then swish them around in your mouth for 20 minutes then spit out. It’s coconut oil so it melts at around 76 degrees. Your mouth is 98, so it will melt pretty fast. Duh! Feeling stupid for not doing this long ago. I make oil pulling bullets by melting coconut oil in the microwave and pouring it into the plastic egg containers. Each segment holds the right amount for pulling. When they harden, I put them in a big glass container and use one each morning. I pop one in my mouth as I am getting into the shower. I also hate that initial feeling of having a ball of cold oil in my mouth. Adding oils will both make the experience taste better, but the oils will help the oil do its job! Thanks so much! It makes it so much better with the oils! Enjoy! If you melt organic coconut oil in the microwave you are destroying essential bits and nutrients, better to do it as suggested in the reciepe above. ? Essential oils can degrade plastic, so I’m not sure the plastic eggs are a safe alternative for molds. As for the oil poppers – there is no explanation on how to use them. Do you let them dissolve and swallow? Do they dissolve and then you swish for 20 minutes? Do you just hold them in your mouth? Chew them? Spit out the contents? Can you please explain? Yes, just pop them in your mouth and chew on them and they will melt, then swish them around in your mouth for 20 minutes then spit out. It’s coconut oil so it melts at around 76 degrees. Your mouth is 98, so it will melt pretty fast.